A perfect blend between dental dexterity and art ! You no longer need to hide your smile because of gaps, chips, stains or misshapen teeth. High quality Porcelain Veneers can easily correct your teeth’s imperfections. They are very natural in appearance and a perfect alternative for you to have a stunning smile. We call this A Smile makeover, and it is customized according to your unique preferences. Porcelain veneers are also an excellent option for patients who are simply looking to have a gorgeous smile. Veneers are known to have an astounding aesthetic results. Dr. Truong has skills to enhance your smile by recontouring veneers to leave a lasting impression. A craft mockup will be prepare for you to preview. The number of veneers you need will depend on what aesthetic results you are trying to achieve. Dr. Truong will assess the width of your smile and the appearance of your neighboring teeth to determine if an alternative procedure (such as whitening, gum recontouring, or bonding) may be needed. Many patients find six or more veneers across the upper arch alone are sufficient. In some cases, upper and lower arch veneers are necessary to achieve the result you desired. Dr. Truong will take an impression of your teeth and assess the symmetry of your face. 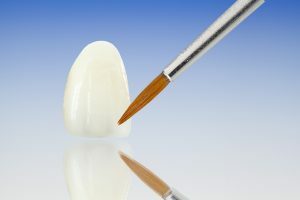 A veneer case includes a diagnostic wax up for you to preview the proposed shape and size of your veneers before we have them made by our Master Ceramist. Our most popular demand is using CadCam software. This advance technology allows us to create an amazing NEW SMILE IN ONE DAY. We design and mill your veneers using CEREC 3D printer with our Ceramist in house. You will have a New Smile Makeover in one visit. Our high quality custom porcelain veneers are affordable. The cost includes the preparation, fabrication, lab fees, and placement of the veneers. We witness positive changes in people’s personalities and the level of confidence after their smiles have been transformed. Schedule your appointment for a Consultation today!